Killer Smile, Lisa Scottoline’s eleventh novel, has already been chosen as Main Selections by both Literary Guild and Mystery Guild. It will also be featured in Doubleday Book Club, Quality Paperback and Book of the Month Club. 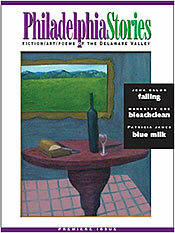 Philadelphia Stories talked with Lisa about her life as a writer, and what it means to be a writer from Philadelphia. What was the inspiration for your latest crime novel? My inspiration for Killer Smile came when my father, who was terminally ill, called me over. He said he had two important things to give me. One was the deed to the family cemetery plot, and the other he said was the last of the family secrets. He handed me two booklets covered in pink paper. They turned out to be my grandparents’ alien registration cards. It was then that I learned an important piece of U.S. history, and a very personal piece of my own family history. During WWII, as many as 600,000 Italian Americans were forced to register as enemy aliens, and thousands more were relocated, and even interned. In Killer Smile, lawyer Mary DiNunzio sets out to get reparations for Amadeo Brandolini, an Italian American who committed suicide while interned during World War II. Mary discovers that Brandolini did not actually commit suicide, and she is determined to find justice for him. The truth is that I don’t write with an outline. When I have an idea, which is only once a year, I go ahead and write it. I let the story develop as I write it. Even I am not always sure which direction it will take. Did you always want to write? No, I loved Perry Mason, and always wanted to be a lawyer. I practiced law for several years, but at the same time I was a bookaholic. Eventually I traded one passion for another. How did you become a professional writer? I was working as a litigator at one of Philly’s most prestigious law firms, when the birth of my daughter coincided with a divorce. I wanted to stay home to raise my daughter, but still needed a way to pay the mortgage. At the time, Grisham and Turow had come on to the scene, and it occurred to me that there was no one writing from the female perspective. I lived off credit cards for several years, and wrote while my daughter slept (which wasn’t much). I had finally just taken a part-time job as a law clerk when my first book, Everywhere That Mary Went sold to HarperCollins. How does the Philadelphia area influence your writing? All my books are set in Philly. I love Philly for its neighborhoods, dialects and heavy dose of reality, and thought it would be terrific to put it on the literary map. The law was also born in Philly, so what better place to set legal fiction books? Can you offer any advice to young writers? Just to go for it! I believe everyone has a story in them, and they should never be discouraged to put it on paper.